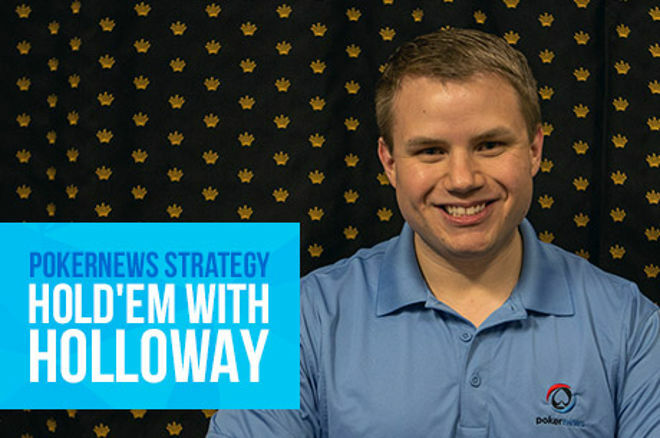 In new Hold'em w/Holloway, @ChadAHolloway says to live you have to be willing to die in tournaments. The late Amir Vahedi once memorably stated at the 2003 World Series of Poker, “In order to live, you must be willing to die.” What Vahedi was really saying was that in order to succeed in tournament poker, you must be willing to play as opposed to letting the fear of elimination paralyze you. In a recent tournament, the $300 Knockout Bounty at Ho-Chunk Gaming Wisconsin Dells — a tournament that attracted 144 entries and awarded $9,331.50 to first — both Michael Miller and I experienced this truth, though in different ways. “At Ho-Chunk I shot myself in the foot again,” Miller informed me after his elimination, which occurred in Level 10 (800/1,600/200) with approximately 45 players left in the field. After a player had limped, Miller did the same with the from the button. Interestingly, queen-ten is known as the “Ho-Chunk Nuts” where I’m from. “I thought I could take the pot down with a good flop, or with a low flop I could represent trips,” Miller explained. However, the player in the small blind proceeded to raise to 5,500, the big blind folded, and the limper called. Miller opted to do the same and the pot swelled to 19,100. All three players checked an flop, and the dealer burned and turned a . The small blind led out for 7,000, the limper just called, and Miller ended up folding. “I was thinking someone had a middle ace or maybe a and I was out-kicked, so I thought for awhile and folded instead of going all in,” said Miller. “I only had around 30,000 left and I don’t know why I couldn’t pull the trigger. As it turned out the river was another and the small blind won the pot with .” A couple of hands later Miller shoved all in from the cutoff with the and ran into the small blind’s to bust the tournament. In the earlier hand, Miller was certainly put in a tough spot on the turn. In my opinion, moving all in is hard to do after a bet and call, though it does fall in line with the attitude that if you want to live you have to be willing to die. Instead, I would have liked to see Miller bet after action checked to him on the flop. Both his opponents appeared to fear the ace, so it would have been a good opportunity for Miller to represent one with a bet, perhaps for 8,000. Had he done so and received a call, he would pair his queen on the turn where action would likely have gone check-check, and he’d trip up on the river. Of course that’s being results-oriented, but I think a flop bet would have been worthwhile in that instance. As Miller pointed out by his “shot myself in the foot again” statement, that wasn’t his first time failing to execute. Two weeks earlier at Choctaw Casino he was in a tournament with 20 of 87 players remaining when he raised to 5,000 with . The button called for about a third of his stack, the flop came down , and Miller checked. The player on the button then moved all in and Miller folded. It’s never fun to look down at a big pocket pair, get a caller, and then have an ace hit the flop. It’s too easy to convince yourself your opponent flopped an ace. However, what a lot of players seem to forget is by showing strength preflop you’re the one representing a big hand. Pocket queens falls into that category, but so do big aces, which you’re much more likely to have. By continuing on the flop, Miller would have stuck to his story that he had a big hand instead of one he was willing to give up on. The pressure would have been on his opponent instead of the other way around. Poker pros continuation bet because they know their opponents are more likely to miss a flop than hit it. By betting, they test the waters to find out exactly where they stand. Most of the time they’re going to win the pot — like Miller would have done had he continuation bet — and in the instances they meet resistance, it’s an easy fold. Of course the willingness to die in order to live doesn’t always play out that way. Sometimes your willingness to die will in fact lead to your death. Case in point, my experience in the same tournament. After being the very first player eliminated — I was a little too willing to die, I guess — I reentered and promptly built up a big stack. Midway through I was sitting on 160,000, which was four times the average. By the time we were down to 24 players, I was still sitting pretty, though several players had closed the gap. That is when the second-biggest stack at the table, an elderly gentleman with 125,000 in early position, opened for 11,500 at the 2,000/4,000/500 level. Action folded to me in the big blind and I looked down at . I could have three-bet, but instead decided to call with the intention of ditching my hand if the flop contained big cards. As it happened, the flop only contained one. I checked, my opponent bet 18,500, and I hit the tank. My first impression was that I didn’t want to play a big pot against the second-biggest stack at my table. I could simply fold, preserve my remaining 145,000, and likely coast my way into the money. However, I couldn’t shake the feeling that my tens were good here a lot of the time. My opponent snap-called off his stack of 115,000 and showed for top pair with a flush draw. I was in a bad way, and paid the price when both the turn and river blanked. I was eliminated a short time later in 20th place for $0. Being willing to die in order to live is a powerful thing, and something I respect in poker. However, it doesn’t always have to be one or the other, something well illustrated by the hands discussed above. Had Miller either bet the flop in his first hand or continuation bet in the second, he likely would have won without putting his tournament life on the line. Likewise, had I simply check-raised a reasonable amount instead of shoving, I would have preserved a ton of chips and lived to fight another day. Be willing to die in order to live, but don’t make all situations that simple. Oftentimes there are other options that’ll help extend your tournament life. Hold’em with Holloway, Vol. 69: Is Your Favorite Poker Pro Left- or Right-Handed? Hold’em with Holloway, Vol. 68: Why Do I Even Bother Drinking at the Poker Table?